Plus, the Pentagon won’t terminate the F-35 program, but it may mothball 3 aircraft carriers. Friday defense links. The Wall Street Journal reports that the Pentagon is conducting a “sweeping overhaul” of its war plans in the Pacific and Middle East theaters, diminishing the role large ground forces play in these plans. “Plans that had presumed the availability of large U.S. forces for invasions and occupations are being redrafted to incorporate strategies such as quick-reaction ground units, air power and Navy ships,” the report said. Cyber will also be a big aspect of the new plans. The Pentagon is denying that it is considering canceling the F-35 Joint Strike Fighter program and a long-range stealth bomber after leaked documents from its strategic review proposed doing just that as a way to implement sequestration. 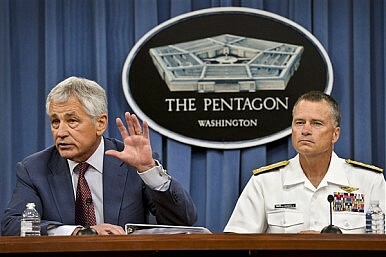 Defense Secretary Chuck Hagel also said at a press conference this week that he is considering mothballing three aircraft carriers as a way to implement the budget cuts. The Chinese Navy has achieved its long-standing goal of being able to “cut through” the first island chains, according to Chinese defense analysts, China Daily reports. The remarks were made on the PLA’s 86th birthday, however, so skepticism may be warranted. The excellent new site War on the Rocks profiles Admiral Xiao Jinguang, the first commander of the PLA Navy. NextGov has launched a new interactive feature called ThreatWatch that tracks data breaches at various types of organizations all around the world. Real Clear Defense’s Dustin Walker reviews the speech that was written for the Queen of England to give to the British people at the start of World War III; that is, after NATO responded to a chemical weapon attack by the Soviet Union by launching nuclear weapons. It was all part of a 1983 NATO war game but the full text of the speech, which Dustin provides, is very much worth reading. F-35 Secrets in China's J-20? Plus, North Korea may be in the clear in Libya, NATO's plans for nuclear bomb integration, and more.